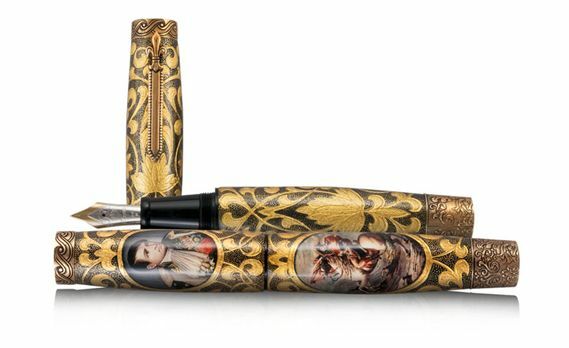 Order your Krone Napoleon Limited Edition Fountain Pen today from FahrneysPens.com. Fine Pens, Refills & Luxurious Gifts – great prices & fast shipping. The Krone Napoleon pays tribute to the legacy of Napoleon Bonaparte. Although widely considered one of history's greatest battle strategists, the reforms instituted by his Napoleonic code still reverberate today. 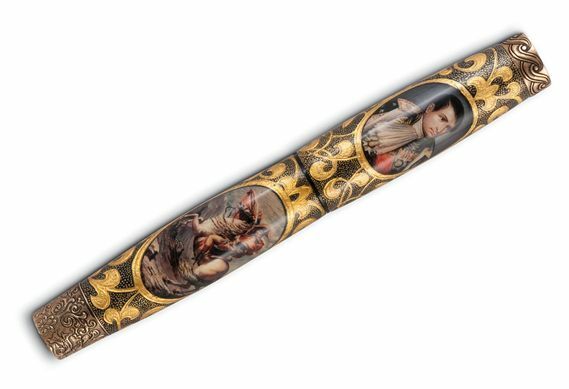 The richly gilded pen features highly detailed, hand-painted portraits framed with gold leaf fleur-de-lis, finely sculpted using Krone's signature micro-chiseling process. Sword-shaped clip is topped with an ornate bronze fleur-de-lis. A coin atop the cap encapsulates a relic: a piece of wood from the chair Napoleon used at the time of the battle of Waterloo in 1815. Limited to 88 fountain pens and 28 rollerballs. Bottle fill only.